the Remote Desktop Services Client for the Windows Phone now comes with RDGateway support (after a long time waiting…). The RDGateway Client works fine but seams to have some issues with self signed certificates if the CA can not be reached to verify the certificate blacklist. So i recommend to use certificate coming from a public CA to make sure it’s working fine. You will get an 0x3000005 error in this case, this error will only happen if you connect thru an external network and not if you try it in the local network. already a year ago I wrote an article how you can change the default port for the Windows Server 2012 R2 workfolder role/feature. By default the Workfolder feature works a “sync” share for Windows 8.1 based desktop systems/VDI’s like a self hosted OneDrive/Google Drive. In the article here i’ve also mentioned that these Workfolders can be mapped to a Terminal Server based on Microsoft Remote Desktop Services and Citrix XenApp. I got a couple of request how the setup should look like so here is a small guide. 1) Install the Workfolder feature (can be found in the file server roles setup) to a Windows Server 2012 R2, make sure that no other feature or application block the SSL Port 443 or modify the Port by following our guide here. During the Workfolder configuration you will be ask what “folder” name should be used, username or username@domain; use username here only. 2) After the workfolder setup is done create a new smb fileshare pointing to your workfolder directory, make sure to setup the exact similar user rights like set for the original workfolder directory. Open Windows Explorer at the Workfolder Server and check the User Rights for the Workfolder and adopt this configuration for the Workfolder Share. If not done right you may mismatch the Userrights and Users may can access files from other Users or loose the Workfolder access. 4) Edit the new policy and browse to User Configuration->Preferences->Windows Settings->Drive Maps and create two new mapping entries, in my sample i map the workfolder shares to drive U: (Click picture to enlarge). Location should be always \\*your_workfolder_server*\*Workfolder_Sharename*\%USERNAME%. 5) Close the policy and logon to a terminal server to verify the configuration, all modified content within the drive U: will be synced to the user devices and vice versa. P.S. : This can be also used with any Microsoft Desktop OS based VDI if you want to use the workfolder sync feature only for physical devices (which make sense to prevent double data in the Workfolder Share and the User Profile/Personal VDisk). If you install the file resource manager to the Workfolder Server to set quotes (like 250MB availabe space per User) make sure to set the similar quote also for the fileshare! P.S.2: The screenshot’s are coming from a production environment, that why the location path is pixeled. maybe you noticed already that the handling for the Startmenu is very different between Windows Server 2012 R2 and old Windows Server versions like 2008 R2 and so on. These configurations will also work for Windows 8.1 incl. Windows 8.1 RT (Require enabled Group Policy Client service or local Policy setup). A lot of Administrator want to modify the Startmenu and to offer a standard view for all User, this can be a very tricky task and i saw already a lot of funny way’s how to edit it. To clear this up a little bit i would like to suggest you two ways how this task can be done, the first variant will introduce you a “static” way. Static means the User will get a “fixed” Startmenu without the ability to change something here. The second way will introduce you a way to create a “default” Starmenu that can be modified by the User. So you can figure out which way works best for you, depending on the scenario, for example if you deploy Terminal Server thru Citrix Provisioning with an static base image it doesn’t make sense to give the User the ability to modificate the Startmenu in any way. These configurations can be done thru local and/or domain policies. 1) Login as User with Administrator permissions and install/setup all Applications you want to provide to the user. 2) Setup Starmenu like it should be “published” to the users. 3) After you have finished the final look and feel create a new SMB Share on any fileserver in your environment, call it “startmenu” or something similar. 5) Logoff from the Terminal Server and start the GPMC (Group Policy Management Console) on any domain system where the GPMC is available. 6) Create a new policy (or use an existing Policy) and link it to the OU where your Terminal Server Users can be found and click the right mouse button->Edit. 7) In the policy browse to User Configuration->Policies->Administrative Templates->Start Menu and Taskbar and edit here the setting Start Screen Layout. 9) Close the policy and make sure the policy is assigned to the right OU, after this login to the Server and verify the result. Please note: The Startmenu can not be modified thru a User! For the Export-StartLayout command (4) you have to use the XML format for the export, the bin format can not be used thru the policy! If you assign the policies to a Computer OU like your terminal servers don’t forget to enable loopback processing! Update: I forgot, Applications where the shortcut is not listed in %ProgramData%>Microsoft>Windows>Start Menu may dissapear after the second User Login (Notepad, Internet Explorer default entry as example). So you may have to create the Shortcuts by your own and assign it to the Startmenu before exporting the XML file. In this folder you can also setup the Applications that should be shown to the User in the “full” Starmenu applications view by editing the User permissions for each file and folder in a very simple way. As example if you want to hide the Windows Store disable the permission inheritance and set the User permissions to full access for “Domain Administrators”, “System”, “Administrators” and add the Usergroup(s) which should be able to gain access to the Applications thru the “full” Startmenu view (Arrow down button in the Startmenu). If you want to be more secure regarding the general Application access you can also combine this with the Windows Applocker feature. There is also an alternative described here: Microsoft Platform, this way allows also provide write access for the users but it’s a little bit tricky to set it up and can cause issues in production. I personal do prefer Way 1 which make more sense for the most scenarios, so i do provide only the link to the source. if you are looking for a small tool to simple configure a bunch of Microsoft Remote Desktop Service settings for Windows 8 (.1) or Windows 2012 (R2) than you should try our latest Tool “Remote Desktop Services Configuration Tool” which is now available as public Beta. The tool can also import and export settings, as example to switch settings very fast between different system’s or to adopt a configuration from a production system to a trial system and so on. P.S. : Please report bugs or settings you want to see in later versions to us, see readme.txt for details. if you are using Windows XP as VDI or have old Terminal Server’s (incl. Citrix solutions) running Microsoft Windows Server 2003R2 or 2008 (32-Bit) you should not deploy KB3013455 which was released during the last Microsoft Patch Day. The Update will cause a general font smoothing issue with a bunch of fonts and the users will/can get a much lower user experience if working with a lot of text content. There is currently no work around for this issue, Windows Server 2008R2/2012(R2) and Windows 7/8(.1) do not show any issue once the update is applied. The MS15-010 article currently doesn’t mention Windows XP (or Vista) but i was able to reproduce it also with a Windows XP 32-Bit VM. P.S. : Some Users also reporting issues with Windows Vista 32 Bit but i believe this is less important for VDI environments. Tip: Business Card Scanners for Linux / MacOSX in virtual environments and without USB Redirection. If you run in a situation like this you should look out for solutions like IRIS Card Anywhere (Canon). Devices working in the same way don’t need a “special” driver installed, they come with an internal memory or SD-Card and can be used like an regular USB Memory and this means: It can be used with Windows, Linux, MacOSX or an Android Tablet providing a USB Port. Disadvantage: They are a little bit more expensive but if you calculate the work to get a driver installed or deployed in your environment than you will have a much cheaper TCO. It will provide you a lot of more features and it’s work to test it incl. with the IGEL LX/OS RDP Client. At this point i would also like to announce a new small upcoming tool from cloud-client.info that will be released soon. This tool will provide you a lot of configuration options for the RDP Protocol and some related configurations incl. a simple way to import and export a bunch of RDP settings from one system to an other system or from policy to local configurations incl. the easy handling of several configurations for tests/productions/lowest network use/best user experience and much more. It is mostly designed for Windows Server 2012 incl. 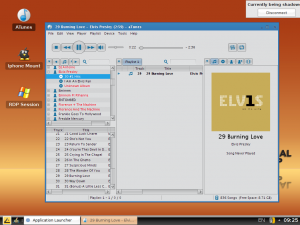 R2 and Windows 8 but will also work with some limitations for Windows 7 and 2008R2 incl. the RDP8 update if installed. do you get performance issues if using Adobe Acrobat Reader on a Terminal Server / VDI? First of all you should be aware that the Adobe Acrobat Reader works with User based settings, this is very important to know because you need to make sure that all configurations “must” be applied to the User hive in the Windows Registry. This can be done thru a Windows Login Script to apply the registry settings and so on but never forget to do it! You also can provide the User a settings guide, but this mostly is not usable if you are working with a bunch of users and not only a small group. So where to start? First of all you should install the Adobe Acrobat Reader you want to use, all settings provided in this guide are pure Acrobat Reader Settings so it can be used with VMWare View, Microsoft Remote Desktop Services, Citrix XenApp/XenDesktop or whatever. The screenshot is from Adobe Acrobat Reader Version 11, if you are using an older Version you will also have an Option “2D Graphic Acceleration”. This setting should be also disabled, disable also the “Auto Update” Feature in the Updater configuration. Now close the Acrobat Reader and open it again and try the same test as done before, the result should be much better now. Please note: The registry file is configured to be used with the Acrobat Reader 11, if used with an other Acrobat Reader Version open the .reg file with notepad and replace “11.0” with your Version like “10.0” and so on. Info: Will Microsoft’s licensing change boost VDI installations? What does it mean? Microsoft changes the Licensing for Desktop OS’s from per Device to Per Device and Per User for Enterprise customers and allows also a installation at the same time on any device incl. Tablets. This can be a big driver for Enterprises to roll out or validate Desktop VDI Installation in the upcoming months now, it makes VDI licening much more simpler and flexible for Enterprise customers. It also includes Windows 8.1 Pro and Enterprise incl. Windows 7 and 8, so it’s not only limited to devices running Windows 8.1 Enterprise and this point could be important too. For VDI also important is the Remote Access Right and here the Per User option comes with “Any device” access, the device licensing only offer support for “noncorporate” devices. Means the User licensing supports now also corporate owned Linux based Thin Clients or IOS/Android based devices. very often i’ve been asked how to setup the RDP Client coming with the IGEL Linux to use the Microsoft Remote Desktop Connection Broker in the right way. So here is a new Whitepaper how to setup this step by step, the Whitepaper is based on a Windows Server 2012 R2 environement and the current IGEL Linux Firmware 5.03.190.
maybe you also agree that Adobe Flash content is one of the biggest crap that can be used in a Terminal Server/VDI environment. For example youtube or similar site’s mostly waste expensive Server CPU resources only for watching a “funny” video..
Yeah… One User with one HD Flash Movie use 41% of Server CPU resources! HTML5 is still not a big deal for most site’s, so how can you handle it? 1) Ban it… Block unwanted traffic with a firewall or proxy. This is highly efficient but will upset the user base and maybe you need it (schools/education), so mostly this option is no deal. 2) Buy more Server.. More or less efficient and very expensive (Hardware, licensing, setup and cooling). No deal! 3) Use solutions like Citrix HDX Flash Redirection… More or less efficient, hard to setup and not 100% compatible, it could be a option but it’s not a real solution. 4) Ban it from the servers… I just setup this for a PoC and it seams to be the most efficient way which is also acceptable for most users. So how is the setup? a) You need IGEL Linux based devices (LX or OS) based on the x86 architecture to do this. b) Setup a local Firefox browser session and deploy any Version of the Adobe Flash Player for Linux to it (Browser Plugins in the IGEL Setup). c) Assign a Hotkey to the Firefox Browser Session like ALT+CTRL+i. Do not perform this for any Website which is used for “business” uploads/work! Don’t use a DNS Server to apply the configuration, this might also point the Thin Clients to a “wrong” site… Of course you can also add Webradio Website’s, browser based games or what ever you don’t want to see in a Webbrowser on the server backend. But at all.. It’s not a security solution at all, it’s to save resources only! f) Create a small HTML Website with a short Text like “This site can not be used on a Server/VDI! Please press ALT+CTRL+i to open the local Browser and use ALT+CTRL+TAB to switch between the Browser/Session.” or similar. Make it simple and easy to understand… Now set this HTML Page as default and 404 error page for the new Webserver (d). g) Let the user test it… If the User enter www.youtube.com the “new” Website will open and point the user how to work with the local Browser.. For the User it looks “very” embedded into the session, not 100% but it will be good enough to watch movies for most of them. I know this solution is also not a 100% one and it can be bypassed if the User is using the IP. 😉 ..but it’s not a security solution, the User can watch Movies and you have minimized the wasted CPU resource on your backend. It’s easy to control, high compatible and everyone is happy. From my point it’s currently the best way to handle Flash until it will be fully replaced by HTML5 or any other “better” working solution. The performance depends on the User device, a UD5 will better perform than a UD2 but still: A slow client is better than a slow server for most company environments. Also some more benefit’s.. You can seperate client traffic from your server traffic quite simple, the customer where i suggest this mentioned that they have 10GB or more “flash” streaming traffic (only youtube) per day in the server infrastructure with a little bit more than 300 user’s. You can use it with any Terminal Server/VDI solution but please note: If using VMWare View, Microsoft RemoteFX, Citrix XenDesktop x.x / XenApp 7.5 or any other solution that support real USB redirection don’t setup USB Redirection for Human Interface Devices (HID) because in this case the Mouse and Keyboard can not be used outside the Session (…and with the local Browser). You can also add other description’s to the created “manual” website, for example for Android press the home button and open the local Browser or similar. If you have suggestions to improve this solution feel free to give me a mail or add a comment. If using the IGEL Universal Management Suite (UMS) make sure the profile is optimzed for a Firmware 5.x.x. In the setup browse to Sessions-RDP-RDP Global-Options and enable the RDP Legacy Mode, if you are using an older UMS Version and the setting is not shown in the GUI browse to System-Registry-RDP and enable RDP Legacy Mode here. Assign the profile and restart the RDS Session, issues shown on the server (like not working RDS Services) should be gone now. 1) In RDP->RDP Global disable RemoteFX (similar for sessions if the global configuration is not used)! 2) or enable the Legacy RDP Client in RDP->RDP Global->Option, make also sure that RemoteFX is disabled! If you not perform one of these steps a connection from the client can have a impact for all connected RDS Users (EventID 1503 and other on the Server). Please note that the new IGEL Remote Desktop Service Client is not really designed to work with such old systems like Windows 2003 or similar! i really could kill some Microsoft developers tonight… Just kidding but this has taken three hours of time to fix a really stupid issue. There are several Tips and Clues available and i’ve tried everything more than one time (! ): Store Reset (wsreset.exe), installing Updates, deleting the Software Distribution Folder, Regional Settings, Time Zone and much more but finally it means: Your System doesn’t fit the requirements for this App! Great.. Why not direct translating it for humans and maybe for the Microsoft Support too (which have also no clue what it could mean)!?! Ok… Enough blaming, let’s come to my solution for Hyper-V based VDI’s: To fix it just disable the Dynamic Memory Feature for the Windows 8.x based Desktops or/and increase it to min. 1024 or better 2048 (or more) MB of RAM. After this small fix everything works like a charm, it seams to be that the Windows Store can not deal with the Dynamic Memory and the result will be this nonsense error message. P.S. : I checked it also with Windows Server 2012 R2, similar behavior… If you got the issue for a physical device try it on an other “better” hardware. Windows Server 2012R2 seams to have an issue with the RemoteFX Graphic Card, if you have an RemoteFX supporting GFX-Card inside of your server (GFX Card is shown in the Hyper-V settings) you might be not able to add this card to a VM with an error “Error appliying RemoteFX 3D Video Adapter changes”. This is mostly not related to the GFX Card, the VM or whatever… It’s related to an issue in the Hyper-V Management console, in all my cases i was able to fix it thru the powershell. 2) Make sure the VM where you want to apply the RemoteFX Video Adapter is not running! 3) Enter and execute “Add-VMRemoteFx3dVideoAdapter -VMName *your vm name*” and execute the command (replace *your vm name* with your VM Name shown in the Hyper-V console). 4) That’s it, start the VM now. it might happen that you run into issues with RDP Sessions in the new IGEL Linux, this is currently very rare but in the case that a RDP Session did not work for you anymore after you have updated from IGEL Linux V4 to V5 you should try the setting RDP Legacy Mode. You will find this setting in the Setup->Sessions->RDP->RDP Global->Options. If this fixes the issue for you i recommend to contact IGEL and provide some details about your Remote Desktop Services setup. i’ve looked out for all changes related to the changes in the Remote Desktop Services coming with Windows Server 2012 R2 compared to Windows Server 2012. 1) RemoteFX Media Streaming improved to use up to 50% less network bandwidth. 2) RemoteFX Codec improvement to require less bandwidth for non-video content. 3) Full support for transparent windows like used in Office 2013. 4) Dynamic monitor and resolution change support. 6) Quick reconnect time, improved from up to 70 seconds to less than 10 seconds. 7) Session shadowing for a virtual machine-based desktop and RemoteApp. 8) Remote Desktop Services roles are now supported on a Domain Controller. 1) Data Depuplication will now also support in use VHD(x) files. 2) Network Card Teaming will increase the total bandwidth. P.S. : The registry tweak to show the Desktop session and also the RemoteApps in the RD Web Interface, if only one Desktop collection is used, will still work ([HKEY_LOCAL_MACHINE\SOFTWARE\Microsoft\Windows NT\CurrentVersion\Terminal Server\CentralPublishedResources\PublishedFarms\Desktop\RemoteDesktops\Desktop] -> ShowInPortal set to 1). Release: Windows Server 2012 R2 and Windows 8.1 are now available for MSDN subscribers! Here is our first custom partition sample introducing Apple device support for all Universal Desktop LX/OS (x86) based devices! Apple devices can be used local, in Microsoft Remote Desktop sevices or Citrix sessions and more. 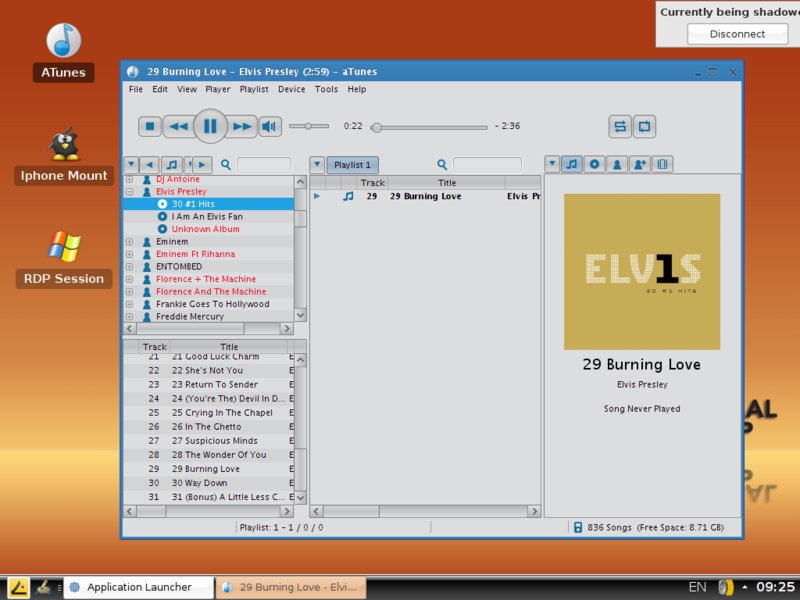 The pack includes also a local running Application (Atunes) which works quite similar to Itunes. Itunes will not recognize the device in a terminal server session but you can use file based Itunes alternatives and access the Apple device file system to copy pictures or what ever! The package is modular designed, so you can seperate not required functions like aTunes…. Have fun and a nice Weekend! very often i’ve been asked how a Citrix or Microsoft RDS fullscreen session can be minimized in an IGEL Universal Desktop LX/OS firmware. By default IGEL has not enabled this but this task is simple to do…. Open the IGEL Setup or the UMS Profile, now go to User Interface->Hotkeys->Commands and select Minimize all Windows… Click on Edit now and activate the hotkey, i prefer CTRL¦ALT and ESC (Write Escape in the Hotkey field to set ESC) but you can also set other combinations of course. Please make sure that your set combination do not conflict with any other Linux or Windows key combination! Close the Setup or the profile (assign the profile to an Client if not already done) and here you go. P.S. : One Extension, of course any local Client key mapping do not work if the keyboard is mapped into the session thru “real” USB redirection! P.S.2: For ICA Sessions it could be required to Setup a second key combination to Stop the direct Keyboard Passthrough, this configuration can be found in the IGEL Setup->System->Registry->ica->wfclient and then configure the following Settings: keypassthroughescapechar and keypassthroughescapeshift. This can be also configured with a profile in the IGEL UMS. If you’re connecting thru the Firefox Browser (Citrix Webinterface) you have to Setup the configuration in the Default.ica file from the Webinterface!